St. James of Jerusalem Episcopal Church of Yuba City is literally “living” our mission to “Feed My Sheep.” Through our 14,000 sq. 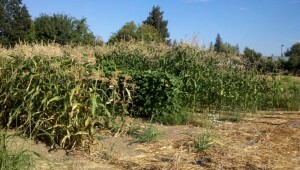 ft., year-round garden, we, with God’s help, produce thousands of pounds of fresh vegetables each year. St. James is a Total Ministry Church, and our garden seems to mirror our journey in that each of us has different gifts to give to the garden, and the garden flourishes because of the abundance of those combined gifts. We have reached out beyond our own walls and even across the river to community churches and schools. River Valley High School Agricultural students started several hundred seedlings in their hot house for us to plant. The St. Andrew’s Presbyterian Church and First Lutheran Church youth groups have come to weed, pick, and distribute food. St. John’s Episcopal Church lunch program regularly comes by to harvest veggies to use for their lunches. The River Bottoms Ministry started providing instruction on cooking fresh vegetables over an open fire, as many of the homeless community only have an open fire for cooking. It is by faith that this labor of love thrives. We have been blessed with a parishioner who is a farmer and provides a tractor and his expertise. Our Senior and Junior Wardens, along with our Rev. Rick Laughman, helped design the watering system. We also received a grant, written by our Pat Harik - Administrator, from Episcopal Community Services to upgrade our irrigation system, greatly aiding in more effective watering of our crops. Our plans include expanding our garden by adding an orchard to provide fresh fruit for the homeless and needy in our community. We have begun to prepare for this by clearing out the area planned for planting. Each member of our congregation contributes in some way to the success of the garden. It is an outward manifestation of our love and commitment to our Mission, our faith and our community. Through God’s blessing of our garden we are able to make a difference - though we are small in number, we are mighty in our faith. For more information about St. James', use the link to visit us on Facebook (at top of page) or send us an e-mail.